Barrel welded to the base. This powerful pump features a solid steel barrel that's capable of uninterruptedly inflating up to 20 wheels in a row with the same number of strokes for each wheel to easily reach 100psi without overheating. 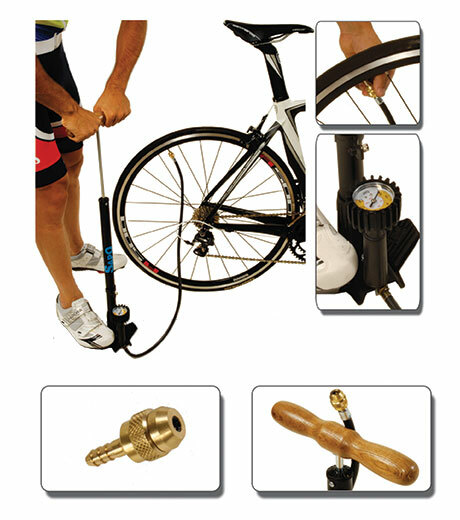 OK PLUS Floor Pump is a dependable high pressure floor pump that easily inflates your tires up to 12 bar/180 psi. This high-performance pump is exceptionally durable and easy to use. 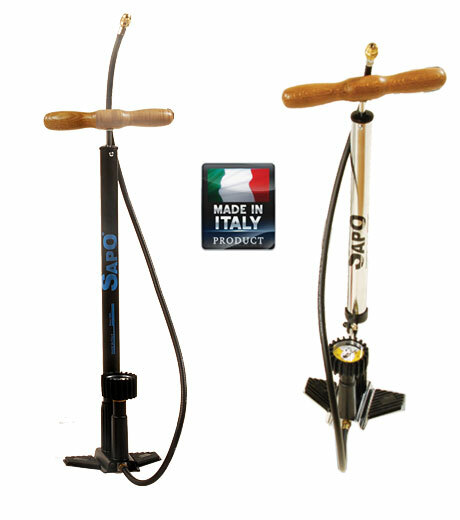 The solid base with large foot pads stabilizes the pump, and the ergonomic beech wood handle makes it easy to inflate. Just screw the JUMBO adapter to the valve, and start pumping. The steel barrel, welded to the base, permits maximum inflation, while the easy to read gauge gives you an accurate reading. The pump is designed for years of performance and completely serviceable. Works with Presta, Dunlop, Regina and Schrader valves. Recommended for road, MTB, BMX and city bicycle tires.